UC Santa Cruz invites the public to experience the future of games and virtual reality at one of the country’s largest student game festivals: the annual Sammy Showcase. 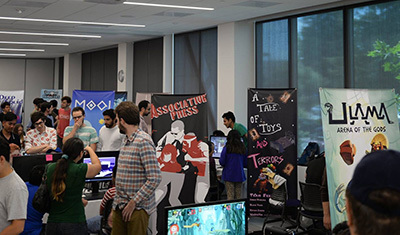 The event includes opportunities for the public to play videogames created by graduate and undergraduate students from both engineering and arts programs at UC Santa Cruz. The Sammy Showcase (named for UCSC mascot Sammy the Slug) takes place on Saturday, June 3, from 1 to 7 p.m. The event is hosted by the Games and Playable Media master's degree program at the UCSC Silicon Valley Campus (located at 3175 Bowers Avenue in Santa Clara). Friends, family, and the general public are all welcome to attend, play the games, and meet the student creators. The event and parking are free of charge. A panel of industry professionals and UCSC alumni will judge each game based on design, technical, and artistic achievement, and the winners will take home a special award at the Sammy Awards Show the following week. UC Santa Cruz, now in its 11th year of offering videogame-specific education, boasts programs at both the undergraduate and graduate levels, across both the Baskin School of Engineering and the Arts Division. UCSC student games have won numerous awards, and both the undergraduate and graduate programs are ranked among the top in the nation by the Princeton Review.